Chairman, T.R.C. Priyantha Kariyapperuma makes the first call after the launch of the cellular coverage. 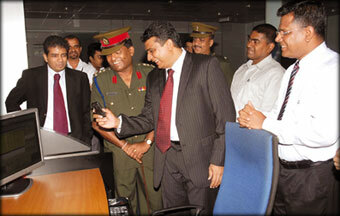 CEO Dialog Telekom Dr. Hans Wijesuriya, Brigadier Prasad Samarasinghe and other officials look on. Dialog Telekom, the country’s largest telecommunication service provider commissioned its services in the newly liberated areas of the Northern province this week. The cellular coverage was launched within 90 days after the liberation, around 60 towers are expected to be set-up within the next two months with an investment between US$ 5-10 million. CEO, Dialog Telekom, Dr. Hans Wijesuriya said the entire Northern province will have access to state-of-the-art telecommunications services within the next couple of months. “The company made this landmark achievement due to the commitment of the government to deliver telecommunication solutions to the liberated areas” Dr. Wijesuriya said. The mobile coverage reaches Kilinochchi, Mullaitivu, Mankulam, Pooneryn, Elephant Pass, Thunukkai and Madhu. Chairman, Telecommunication Regulatory Commission, Priyantha Kariyapperuma said the private sector has taken the lead to develop the communication network in the country. “Work on the 172 meter Kokavil tower for broadcasting and telecasting will commence next week. The project is expected to complete in 120 days”, he said. Chief Signal Officer, Brigadier Prasad Samarasinghe said the launch of the 3G solutions in the Northern and the Eastern provinces will help build understanding among the people. “Communication will play a vital role in helping the people to rebuild their livelihood”, he said.